Being in the same room, breathing the same air. Sitting on a toilet seat, touch a door handle, drinking from the fountain, sharing of food utensils, sharing equipment at the gym. What do all these activities have in common? They are misconceptions surrounding the transmission of HIV. And because these misconceptions and myths exist, stereotypes are often formed of PLHIV (persons living with HIV) resulting in the stigma they experience. Recently, there has been a spate of unhappy events surrounding the leak of the MOH (Ministry of Health) HIV database. PLHIV have become the victims as their confidential information were compromised. This leak compounded with public misconceptions and stereotypes have made it harder for some PLHIV to return to the normalcy of their daily lives. Because of this, i wanted to take this opportunity to pen my personal thoughts as a physician who has looked after PLHIV across different age groups and hope that these first hand experiences of mine can contribute towards breaking down the stigma and negative public perception of this disease. Yes there needs to be a clear distinction that this disease is bad. But, the person who has it is not, and sometimes even the innocent party. There is no difference with a patient who has cancer. We hate the cancer but still love and support the patient in his or her journey. We have to be clear about this distinction when it comes to interacting with PLHIV. I remember my first exposure to a patient with HIV was during my medical school days. Me being diligent and wanting to impress my Professor, whilst not looking stupid in front of the class proceeded to meticulously examine this Grey haired and neat looking gentleman that looked like he was in his 50s, listening to his lungs, heart, looking for any external features which might suggest a disease. I was resigned to being incompetent and awaited my deserved chastening from my Professor for not being able to elicit what was wrong with the patient. This episode profoundly shaped how I looked after and treat PLHIV: just like a normal patient who sees me for flu (but with the necessary handling of blood and body fluids precautions of course). In the course of my daily work, what continues to encourage me are the patients I meet and the stories of hope they tell. I recount 3 interactions which had left a lasting impression on my practice. I remember my conversation with Thomas, a middle aged man who seemed resigned to his fate with HIV. He had contracted the virus 10 years ago in an unfortunate relationship. Behind that polite and soft spoken tone, I caught a hint of sadness as he shared how he had given up looking for, or believing in the possibility of meeting a partner who could accept his status. I found out that he had good support from his immediate family who had accepted him and understood his condition. I proceeded on to check in on him about the medications he was taking and whether he experienced any side effects. As the conversation progressed, I told Thomas that he was blessed to have a supportive family and for him to have continued faithfully on his medications this last 10 years with the viral load undetectable, is an achievement. As he left the consultation room, I told Thomas that his lived experiences are not in vain. And that someday I would meet a newly diagnosed HIV patient and recount his story of acceptance and support from his family. Of soldiering on with medications and doing well medically this last 10 years. I told him to continue to stay strong, as his journey will be an encouragement to another starting on this journey. True enough, I met Michael and Ginny a few months later, who saw me and was anxious over Michael’s test result. Michael had been tested positive with HIV. It was a bombshell for Michael as he was silent throughout the consultation. Michael and Ginny were newlyweds as well. The first thought I had to myself was “How can I encourage this couple and hopefully convince Ginny that HIV is something manageable with regular medications, and that Michael could live a normal life just like anyone else”. I was shocked as I saw that Ginny was neither afraid nor angry about her husband’s situation, and yet extremely supportive and proactive in doing a huge amount of research on his condition, what the best treatments might be, and even the possibility of having children with him. Yes it is possible to have children without HIV even if one partner has the virus. Modern medicine has advanced to the point where an undetectable viral load makes the virus un-transmissible. As the consultation drew to a close, I find myself quietly inspired by the support Ginny had for Michael and how this revelation did not rock their marriage. I ended the consultation sharing with them how Thomas had done well with medications the last 10 years and even though Michael had just started his journey as a PLHIV, with good support and medication, he too, would do well. At this moment, it dawned on me the conversation I had with Thomas months ago and smiled to myself as I saw Michael and Ginny visibly encouraged as they began their journey. The last story I would like to share with you is one of Mrs K. A lady in her early 60s that left a deep impression on me. Mrs K, had been married for more than 30 years and her children were all grown up now. She shared with me that whilst she did not carry the disease, her partner had unfortunately carried the virus. I ended my conversation with her deeply humbled at the privilege to care for her and thought about Michael and Ginny imagining them 30 years down the road with grown kids as well. PLHIV come from all walks of life. Just like how Thomas’ story of hope had encouraged Michael and Ginny, and how Michael and Ginny’s story was a journey that Mrs K had walked through, their stories come one full circle and become an encouragement for another on the same journey. These are stories that we should not be ashamed of. But it is through the common theme of hope between them, that every life, every story has a ripple effect in defeating the stigma. You may be an active-ager, or someone who has lived life through the decades, but you too can play a part in defeating this stigma. 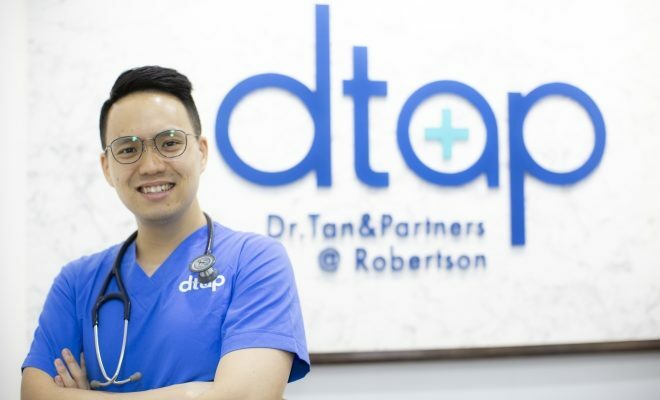 Article contributed by Dr Julian Hong, DTAP Clinic Group (Dr. Tan & Partners). Names and backgrounds of these stories were modified to protect the confidentiality of the persons and their loved one. Their stories and their journeys remains unchanged. ← Previous Story Sarcopenia as a silent killer: what can we do to protect the elderly today? Next Story → How Often Should You Work Out?